Our passion is to provide support services to the community of individuals, groups, clubs, schools, associations, and sponsors interested in encouraging the development of riders of all ages, abilities, and levels, as well as to increase the awareness of our sport. 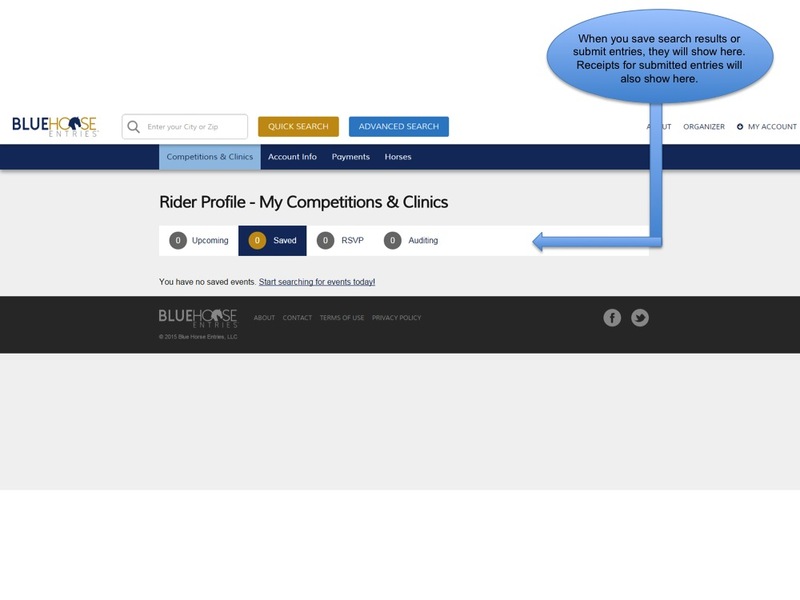 As we grow the number of organizers listing with us and add rider profiles, it will become apparent we have provided a better way to search and enter competitions and clinics. 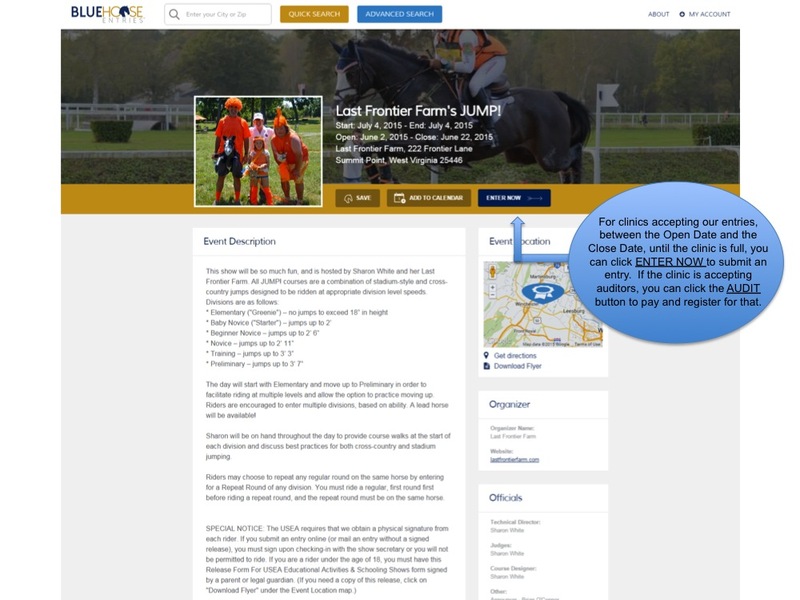 We can accept entries for shows, as well a registrations to ride in or audit a clinic. 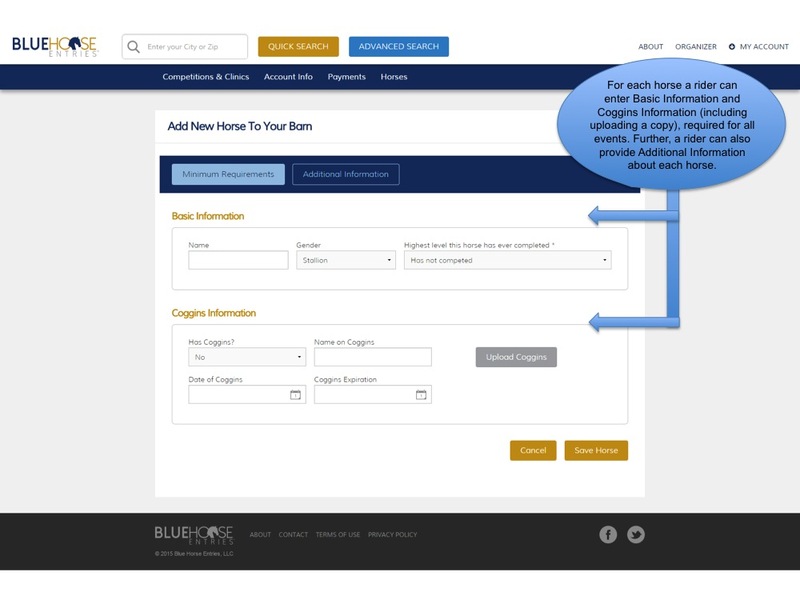 Give us a try! 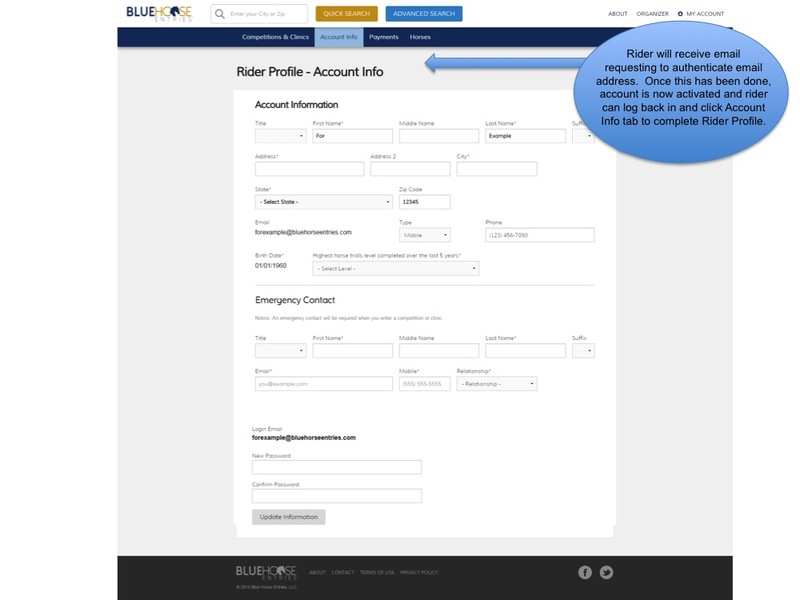 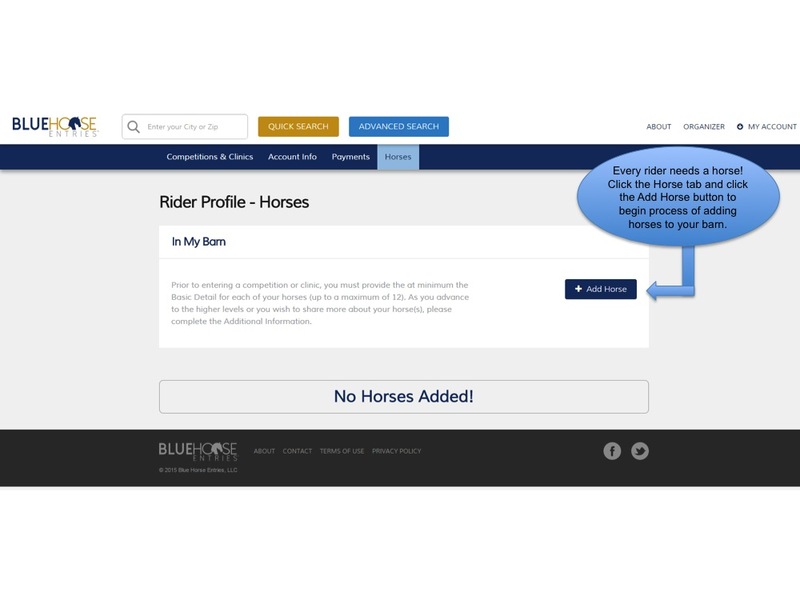 If you are a rider, create a rider profile and start saving competitions and clinics to your profile or add them to your calendar; if you are an organizer, contact us to find out how you can have more riders know about your events. 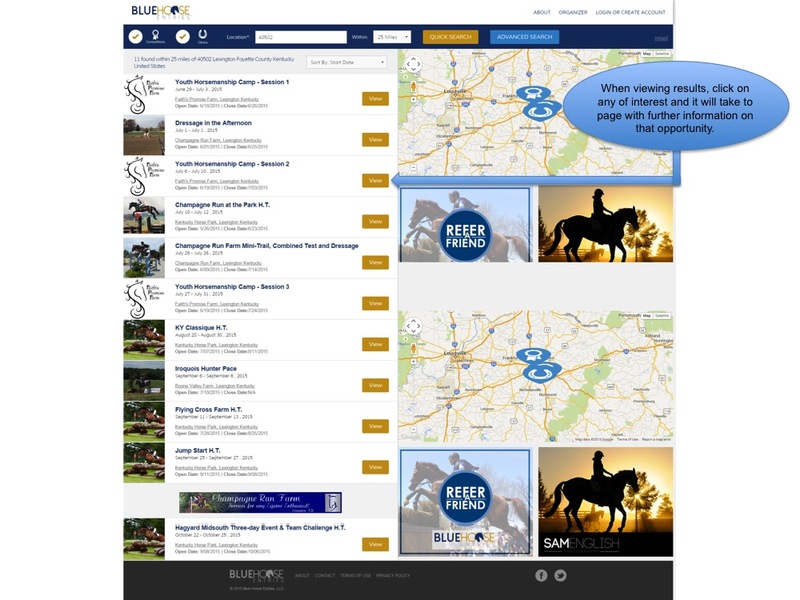 Either way, we hope you will check back often to see the new listings and features we have planned. 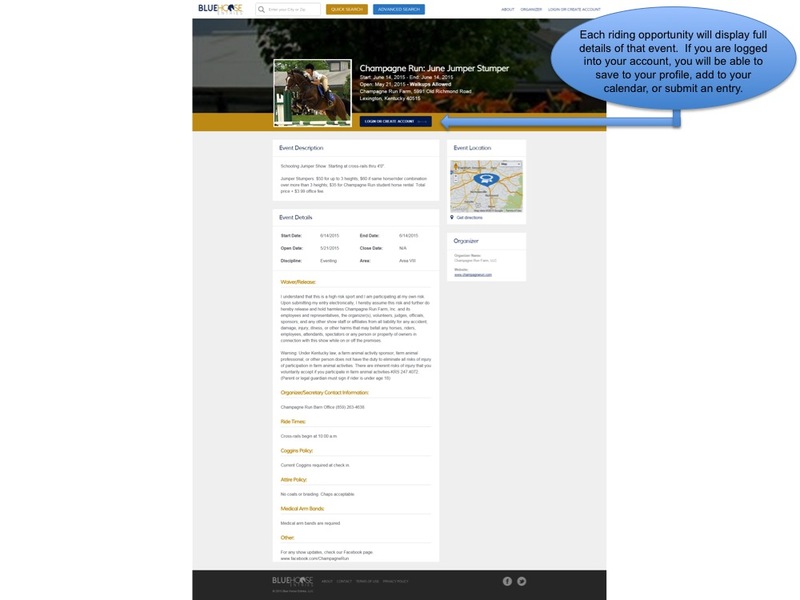 If there are additional services of interest to you, please let us know at wearelistening@bluehorseentries.com. 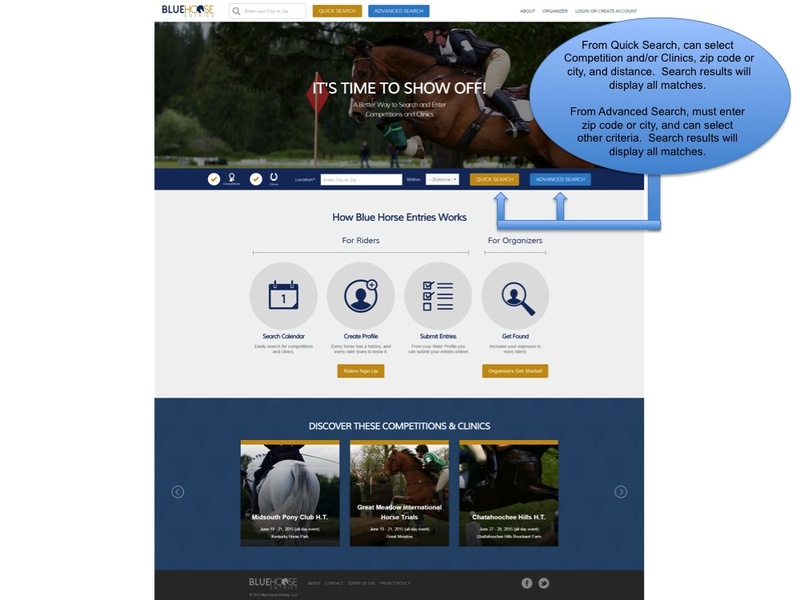 This website is only our first step toward creating one cohesive, easy to find, and intuitive location to search for competitions and clinics. 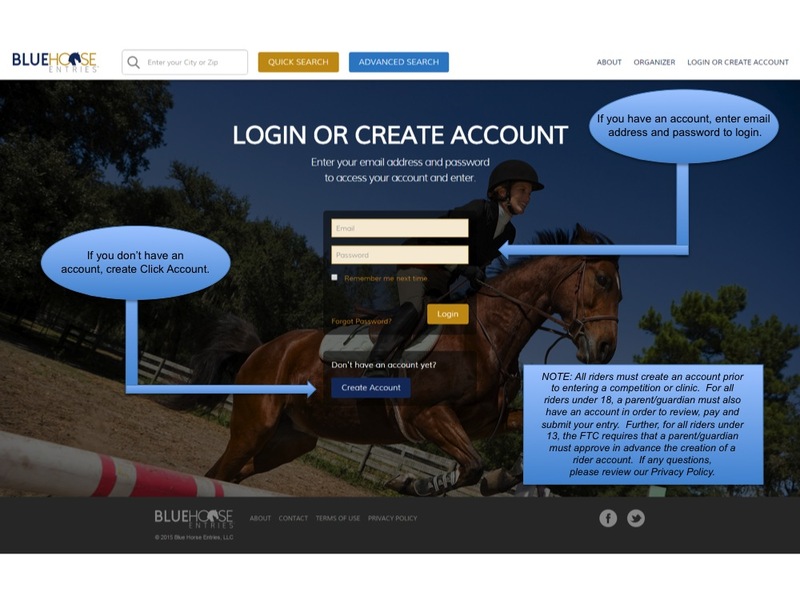 If the organizer has signed the Blue Horse Entries Organizer’s Agreement, we can accept signed entries and payment online. 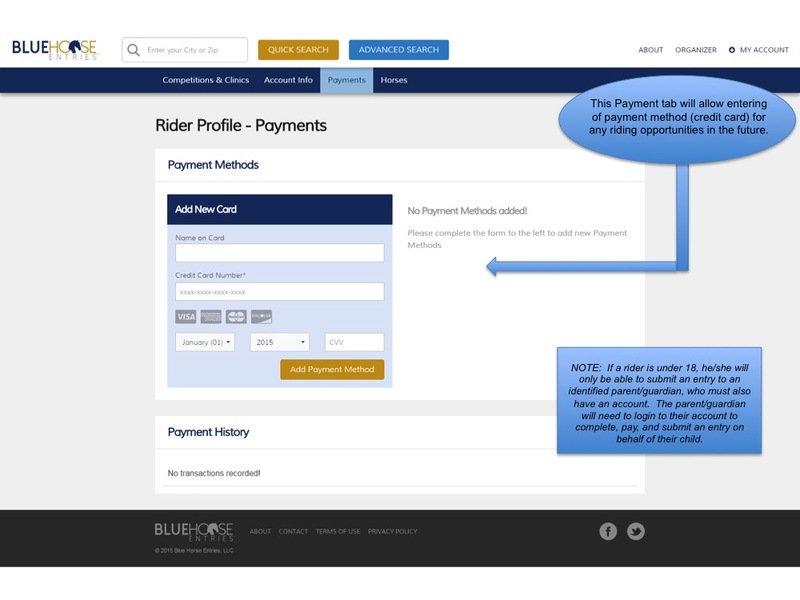 No more printing, signing, writing a check, and mailing! 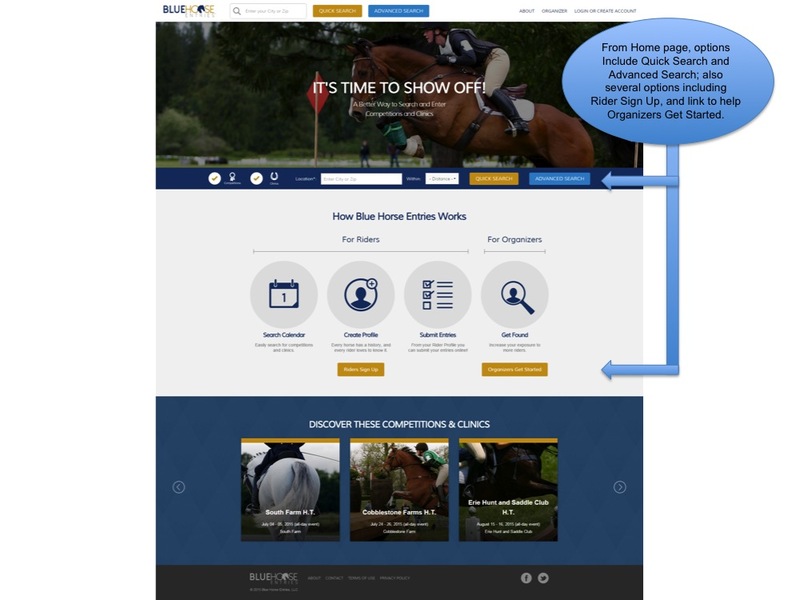 We will maintain a central focus on providing services and support for riders, horse owners, show organizers, and clinicians. 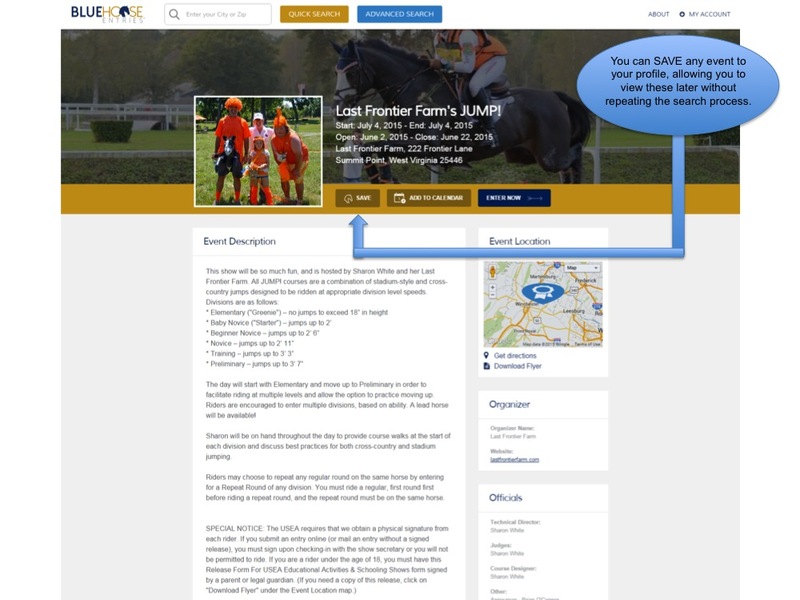 Our success will be measured and driven by growing our community and becoming the leading location where riders and owners come to search for their next ride. Since we are not affiliated with nor restricted by any association, group, club, school, or similar organization, it is part of our vision and corporate culture to be an active promoter of their activities, and to collaborate with all desiring to enhance the support and awareness of our sport. 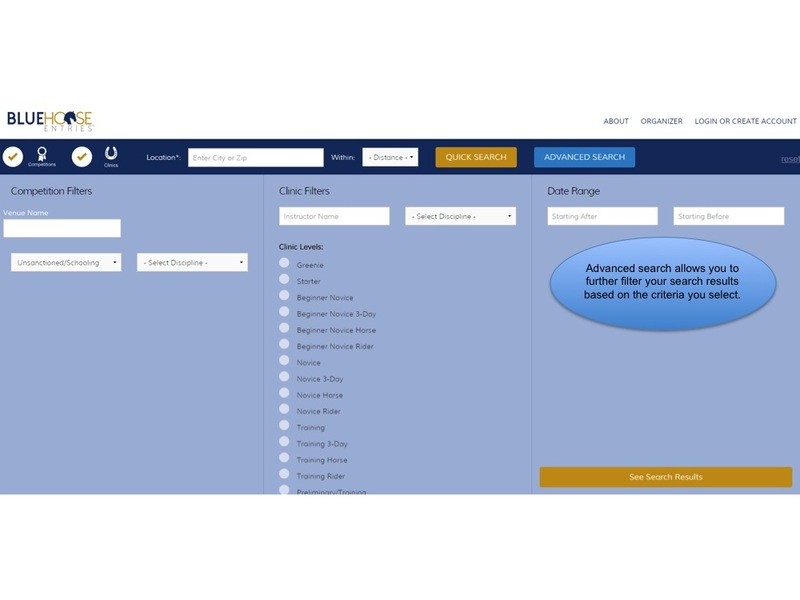 We are always seeking ways to improve our service and would love to hear ideas from you as to exactly how that can be accomplished. 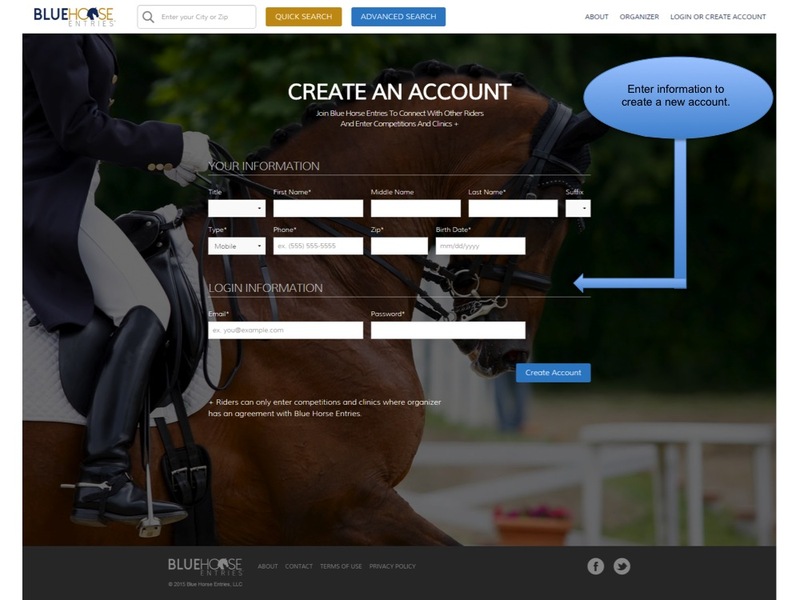 You can email us at wearelistening@bluehorseentries.com. 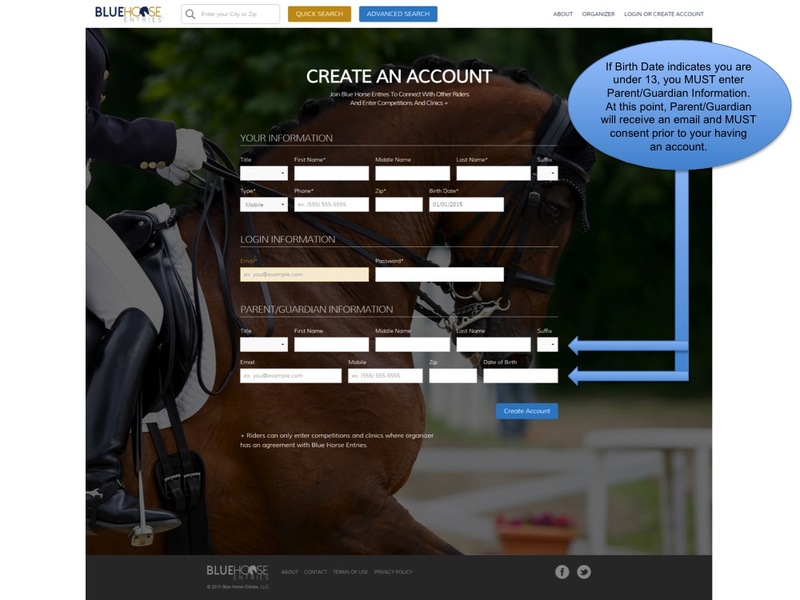 Find everything you need — quickly and simply — with Blue Horse Entries.